As a saluki fancier of over 35 years in the breed, I agree with many others with a lifetime's worth of experience with the saluki who currently fear for the future welfare of the AKC purbred saluki. Owing to the avaricious ambitions of certain individuals including some in the current leadership of Parent Club, our beloved breed faces the imminent threat of "band wagon" importation and popularization of dogs from unknown and questionable parentage from areas of the Middle East (Iran predominantly) with the ultimate goal of eventually working them into the American gene pool via the Society for the Preservation of the Desert Bred Saluki--itself a victim of the same junta that now controls the SCOA. These dogs are touted by their importers (currently a notorious American importer is dealing in illegally "laundering" dogs out of Iran through Turkey to America) as somehow "pure" and coming from regions formerly "untouched" by Western Civilization, commanding high prices well into the 4 figures. These dogs often exhibit few of the traits of purebred salukis and many traits one would expect to see in the types of sight hound crosses that have become common throughout the world. Some have some saluki-like traits, some have traits of greyhounds and afghans, some exhibit non-Standard colors (BRINDLE is not a color in any saluki Standard in the breed's Western foundations of early desert-breds, early 20th century-1930s--and since) and many are of such poor quality and have exhibited such alarming temperaments, that one wonders about the motives of the people who argue that these dogs will provide a valuable way to "widen" the saluki gene pool and provide for "diversity." 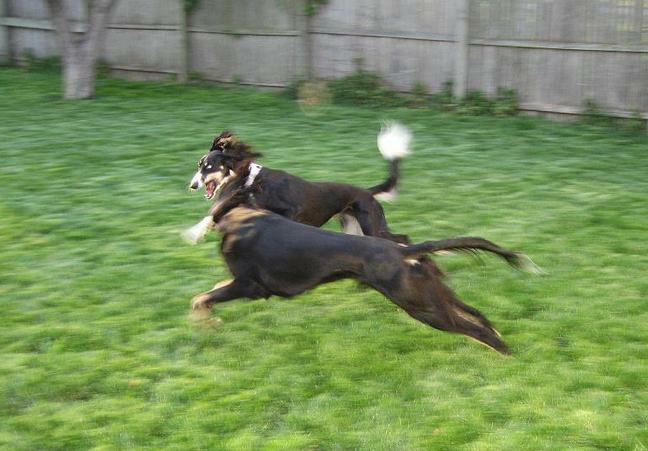 But the main point is that their backgrounds quite often are simply NOT verifiable as purebred salukis. The purveyors of these animals do not care that the backgrounds of many of these dogs CANNOT be traced even through an oral tradition. There is no way to guarantee that they are NOT the result of cross breeding. They only care about selling these dogs for large prices and getting their "gene pool" into the AKC registry. 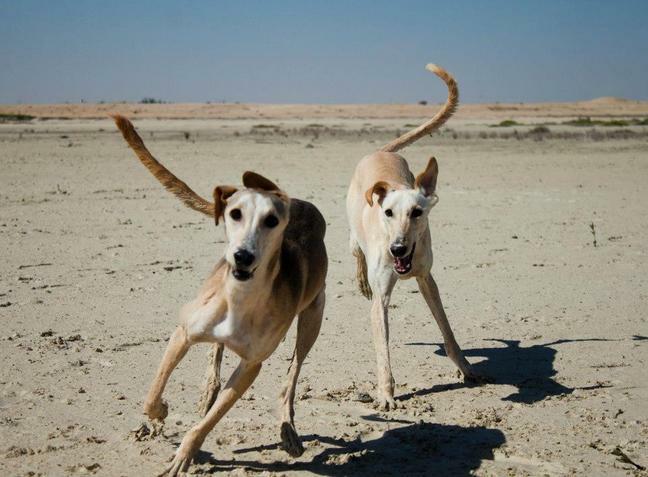 The Middle East has changed since the "founding fathers and mothers" of the breed in England first brought the saluki out of the deserts of the Middle East at the turn of the 20th century. For at least 50 years, and especially the last thirty years, the changes wrought in the region preclude any area as free of Western influence. There is NO "Shangri La" where salukis can be found "untouched and original." Those days are long over. The characteristics sought and set by consensus of the founding generation of English breeders molded the purebred saluki as it has come down to us. Today, the buying and selling of all kinds of hounds, and the mixing of these hounds for whatever purpose (but always with MONEY the supreme goal) by Middle Eastern and American brokers has gone on apace. The salukis brought from the ME in distant former decades and worked with care through the SPDBS as formerly constituted, paid close attention to the backgraounds and ORAL TRADITIONS that lay behind these hounds. But to argue today that salukis have been "bred for thousands of years before the purebred Western saluki" came along and that these are no different, and that anything that runs in the deserts of the Middle East (or bred in the garages of dog brokers in ME cities) today is worthy of being called a saluki, no questions asked or pedigree presented, is disingenuous at best, alarmingly a-historical, and destructive to the purebred saluki at worst. The person new to salukis is bewildered and perhaps taken in with the romance of having something "from the desert." BEWARE the individual with such claims to this nonsense! They are out to exploit the saluki and everything he stands for. They worship only the Great God Mammon. The 2011 SCOA "Standard Ballot"
This spring the Board of Directors of the SCOA sent out a ballot to the membership to see if (in the words of the ballot) members would like to "change the Standard to address the brindle question." An overwhelming majority voted no. The SCOA Board of Directors will not allow discussion in the club (either at the General Annual Meeting, and the discussion that DID take place at there in 2011 STILL has not been published by the Secretary, as of 1/23/12) or via the SCOA discussion list, which was closed down the same spring by the Board) to ascertain whether this vote indicates approval or disapproval of brindle. 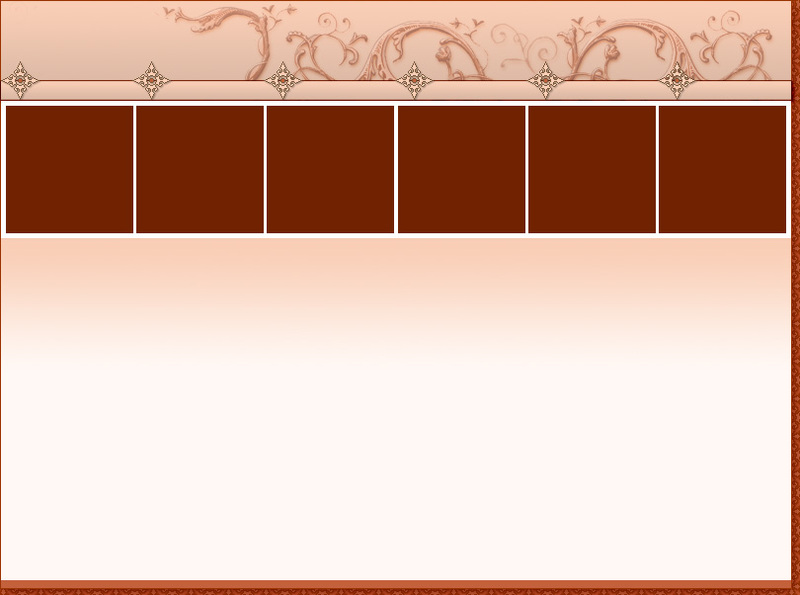 It still refuses to poll the club on a straight up-or-down vote on brindle. Recently the Board has indicated that this vote solved the brindle issue, and seemingly those favoring brindle in the SCOA (and who comprise the majority of the Board and also the Judge's Education Committee) will continue to tell judges that in salukis, "color is immaterial." "Color immaterial" is NOT in the SCOA saluki Standard! Those of us who protest AGAINST the "color is immaterial, therefore anything goes" proposition for salukis accept the Standard as it reads, and voted NO on this ballot. We defend the Standard as written--with its list of accepted colors/patterns, with the understanding that all STANDARD colors are equally valued. Brindle is NOT a color or pattern listed in the Standard, or any supporting AKC documentation about the Standard or saluki colors/patterns (please see: http://www.akc.org/breeds/saluki/color_markings.cfm). Brindle is also condemned as undesirable in the English and Continental Standards. It is up to those of us in SCOA who DO respect the Standard as written to defend it against this sleight-of-hand approach of end-running amending the Standard on the brindle issue without benefit of input by the Membership. Those of us in the Saluki Club of America and outside it who reject this undemocratic and dangerous trend are doing everything we can to EDUCATE the newcomer to the dangers lurking in this unprecedented threat, and to PROTECT and PRESERVE the breed we love. 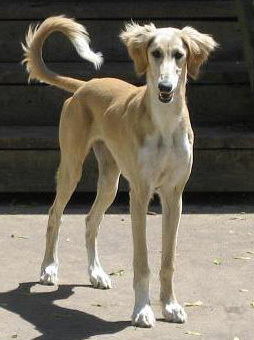 The saluki is millenia-old, one of a handful of what some scientists have termed "basal signature" breeds of domesticated dogs (the basenji and sharpei are two other examples) that have remained relatively un-blended by mixes with other breed-types. This is the basis of the breed's allure for many of us--that at its ancient roots, and well into the twentieth century and even up to the present, the saluki has retained its "ancient" breed purity. It is a long-distance coursing dog originally bred by desert nomads to chase quarry such as desert hare and antelope for many miles over deep sand or rocky mountains. As such, it is probably the toughest of the sighthound breeds and is, in fact, the parent-stock foundation of most of the other cursorial breeds, such as the borzoi and greyhound. The saluki, therefore, retains many of its ancient characteristics, both to look at and live with. This includes a distinct exclusivity for its people. This makes it a breed not well designed for popular and casual ownership. The saluki is very discriminating as to its attachments to people, preferring its family members and eschewing willingness to enjoy handling by strangers. At times this can make handling the saluki a challenge, requiring understanding and tact, but the effort to persuade it that such an activity is desirable is a challnge most of us accept, who know it well and love it. While no 21st century saluki can get along by being snappish, neither should this "exclusive" temperament be bred out of it for the sake of ease in sport, or suburban living. I Truly Love the Look of the Breed. Is it Right for Me? That the new owner has a secure, fenced backyard for GALLOPING exercise. The saluki is NOT a "trotter" and needs room to RUN, fenced and safe from traffic. It is a SIGHT hound and if it sees something enticing (squirrels, cats, rabbits, etc.) it will run--right into the path of a car. That the new owner understands that I have a life-long investment in every saluki puppy I have produced, and should the new "marriage" not work out, I expect to get the puppy or dog back--throughout its entire life. New owners must be willing to sign a contract to this effect. That the new owner UNDERSTAND and CONVINCE me that he/she truly appreciates the "special needs" and temperament of the saluki, do everything possible for their new saluki's health and emotional stability, before they take on this trust. Every saluki is a treasure to be loved and safeguarded, and while sometimes mis-matches occur, every effort must be made by all parties to assure the saluki's happiness and that of its owner. The 2015 SPDBS Booklet, "Building a Better Registration System"
The Society for the Preservation of Desertbred Salukis has just produced and mailed this booklet to the SCOA membership, ahead of a vote of the membership. Essentially, it is a glossy rationale for dispensing with the 4 generation system of critiques for AKC registration eligibility and substituting a much quicker process ("Approved Generation 1 SPDBS CRN-registered Salukis will be eligible for AKC registration."). 1) Concern about the effects of war in the Middle East. Salukis have been registered through the former process throughout periods of war and the absence of war in the Middle East. ISIS is not a relevant reason, imo, to hasten the process. Events that come and go in the Middle East should not have such a profound influence on the breed which has been preserved, not when the "gene pool" is not in any danger of narrowing down to the detriment of the breed--particularly given the infusion of salukis brought in for decades under the old, careful process. 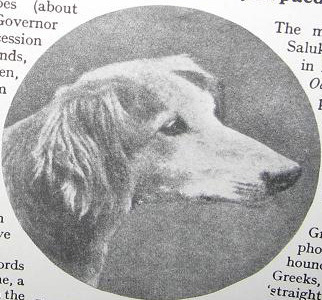 Will saluki breeders look back to the "good old days" when their salukis had to undergo a much more rigorous process? 2) The owners of imported dogs want "more opportunities to compete in organized dog sports." This is a non-reason to me. Being careful of the background of imported hounds, as with the former 4 generation process, should come before interest in sports competition, which is a human desire and not related to breed preservation--which has to be the first concern. I believe that the present system in SPDBS should be maintained. If anything, the process needs to have a higher bar, not a lower one, for AKC eligibility, given the profound changes in the modern Middle East outlined above.